Tropical Plam Tree Shirt. Color White with Black and Gray Palm Trees. Also, Check out our We have a Huge Selection of NFL, NHL, NBA, MLB, and NCAA apparel. Waist = 32-34. Hot Rod Hawaiian Short Sleeve Camp Shirt High Seas Trading Company Made in USA Brand New w/Tags Size: M This is stock from our shop when we use to carry this line Thanks For Looking God Bless! Shirt Length (Neckline Seam-Bottom): Approx. No local pick up is available. Material: 100% Cotton. Color Splatter Pattern. Chest: Pit to Pit. Short Sleeve Casual Button Front Shirt. Length: Center of collar to bottom seam. Camp shirt. I am a single father, who works and attends college, to make my life, as well as my son’s life, a better one! I will do everything, within reason, to make your experience a better one. Has wrinkles. Length: 29 " (top of the back collar to the bottom of the shirt). Sleeve length: 10" (top shoulder seem to the end of the sleeve). Light to moderate wear throughout.nothing severe. Weight: 6.5 oz. Building a reputation is a matter of principals and dedication. Jimmy Buffet Margaritaville Short Sleeve. Vans The 2018 VTCS Aloha Shirt is an Aloha shirt featuring a 2018 Vans Triple Crown of Surfing triangle checkerboard print. Color: Black Multi Color. Fabric is 100% Cotton with a patch pocket. This Shirt is in very good condition. 7 button front. Made in India Size: M.
In Very Good Condition. Professionally Cleaned and Pressed. Retro Hot Rod Route 66 Short Sleeve Camp Shirt High Seas Trading Company Made in USA Brand New w/Tags Size: M This is stock from our shop when we use to carry this line Thanks For Looking God Bless! RJC Aloha Shirt Hawaian Blue Green Hula Girl Woodie Car Beach Size: Medium Chest (from pit to pit): 22.5" Length (from shoulder to front bottom hem): 28" Colorful and eye-catching shirt, the shirt is in great condition except there is a small stain at the front below the 3rd button (please see close up pictures for the exact product condition). Please ask us any questions . Thanks for looking!! Pre-owned good condition. Left chest pocket. Men’s Medium. Royal Hawaiian, Outrigger Canoe. Hula Girl, Palms At Waikiki. Aloha, Hawaiian Shirt. Made In Hawaii. 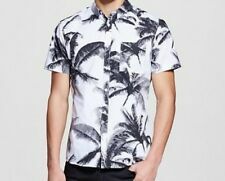 Style: Short Sleeve Hawaiian Shirt.